Flor de Selva Robusto from Maya Selva Cigares is a fragile looking cigar. The wrapper is almost transluscent and it feels light in hand. it is Well rolled and performs perfectly with even burn and great draw. The flavour is mostly floral with tones of spice and wood. A fresh breeze of the summer wind in the burning heat of the sun... And that's about it. Although a good cigar, it seems to be lacking the complexity which would make it exceptional. Not much developement in character either. Still, a decent cigar, which fits after a light meal, lunch or maybe even with champagne. at Tiger NightClub - Helsinki, Finland. Every cent earned goes to charity. 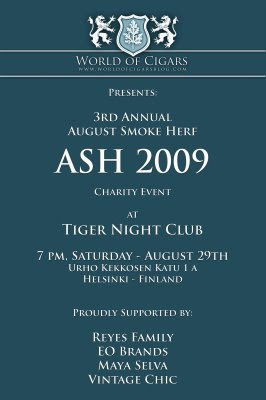 Cigars against donations, raffles, auctions, the whole nine yards. FEEL FREE TO SPREAD THE INVITATION; BUT REMEMBER TO RSVP EVERYONE! See Supporters on the flyer!